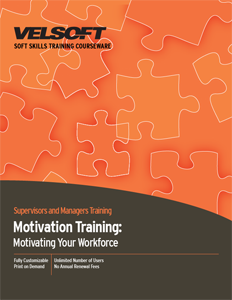 Motivation Training Materials for motivating your workplace is designed for trainers to develop supervisors’ and managers’ motivational skills and tactics. Confidently teach your staff what motivation is, the fears and desires, goal setting, the role of values, how to apply skills and much more! Seeing is Believing This sample manual to teach Motivation Training: Motivating Your Workforce is in MS Word format. This one-day training package is all about developing and sustaining employee motivation. You'll be able to teach participants how to set goals, identify values, design motivating jobs, and create a motivational climate. We've included everything you need to deliver a successful course, including an instructor's guide, PowerPoint slides, pre-assignment, and handouts. We've even included marketing materials, like a course outline and advertorial. Best of all, each component is customizable. We even offer this course as eLearning for students on the go.